Thunder has been working out pretty hard in anticipation of the new basketball season at GCU, as we showed in this recent slideshow. Apparently, he’s not the only one. No matter where you look regarding the men’s and women’s basketball programs this season, the University is pulling out all the stops in connection with its marquee sport. 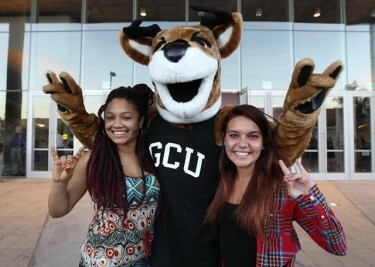 It's 'Lopes Up for Thunder and these two students during the Fan Fest at GCU Arena. From game operations to the sports information office; from an amped-up student section to a new pep band; from an all-new Thunder mascot (and a few of his friends) to a more lively fight song … there are so many new wrinkles geared toward the fan experience for men’s and women’s basketball in Year 2 of GCU Arena, you almost need a scorecard to keep up with them. GCU Today has been keeping track of this full-court press, and we’re here to break it down for you. Consider this your Consumer’s Guide to GCU Basketball. The person in charge of this madness is Emily Stephens, who has added the title of game operations manager to her normal duties as director of spirit programs. This year, that experience will include a new pep band and a new fight song. 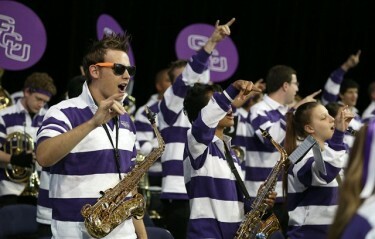 A new band will add to the atmosphere at this year's basketball games. The new fight song doesn’t have words, but it does include spots where fans can chant and cheer. GCU also is handing out 5,000 free game-day T-shirts to staff and faculty. There already has been one giveaway on the main campus, and the University will be handing out more T-shirts at 2:30 p.m. Friday on the Tempe campus, at 2 p.m. Nov. 2 on the Peoria campus, and from 11 a.m. to noon on Nov. 5 (the date of the first home game) on the main campus. Another new game-day amenity this season is a tailgate party for season-ticket holders on the Quad outside the Arena. It begins 90 minutes before tipoff of the men’s game and includes free food and drink. The ’Lopes Season Pass – a smokin’ deal that includes four general admission tickets for every home game, plus access to the tailgate party — is still available to GCU employees for a mere $50 (which equates to about 66 cents per ticket). For ticket information, call 639.8970. Members of the Courtside Club (courtside season-ticket holders) also have access to a halftime tailgate event in the southeastern corner of the Arena. Not that you’d want to stay for too long; Jamie Santiago, director of marketing for the Arena, promises bigger and better halftime acts for the GCU faithful. There also is a Thunder Club for kids, a Pom Club for young cheerleaders and a Ball Kids Club for children wanting to help retrieve balls during warm-ups and help sweep the floor during games. Thunder, GCU’s mascot, is getting a new suit this season – and some company. DJ Lightning will emcee games at GCU Arena. The new suit is a little easier to move in and allows him to be a little more athletic. Thunder gets a new sidekick this year: Bolt, a streamlined mascot dressed in black who will put on trampoline dunking displays at halftime and during timeouts of select games. Consider him the wilder, more rebellious alter ego of Thunder. 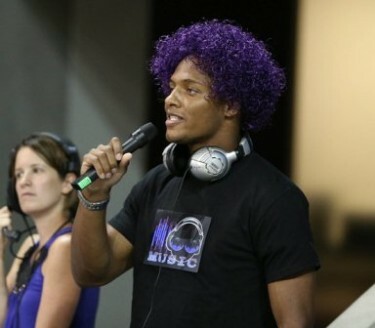 Another new member of the team is DJ Lightning, complete with purple hair. DJ Lightning is actually Josh Allen, a Phoenix-area DJ who will serve as emcee during the games. “You can expect to see nonstop madness between the dance and cheer teams and Thunder and Bolt and DJ Lightning,” Stephens said. OK, we’ve got Thunder. We’ve got Bolt. We’ve got Lightning. All we need now is a good Monsoon. Keeping tabs on the GCU basketball teams will be easier, and more fun, this year. The crew from the Sports Information Department will still provide Twitter updates during games, plus game stories and stats afterward. This year at gculopes.com, there also will be live webcasts of all home games, video segments for pregame and postgame coverage, and a blog that focuses on the atmosphere surrounding the games. In addition, a redesigned website is expected to be up and running by January. Michael McNally, GCU’s assistant athletic director/media relations, said the webcasts will not require anyone to pre-register, as they have in the past, and will be more user-friendly with stats integrated on the side of the screen (instead of having to click to a separate screen). They’re also smartphone-friendly, McNally said. A live audio feed featuring play-by-play announcer Michael Potter will be available at gculopes.com for Friday’s first men’s exhibition game at Utah State University. Utah State will also have a webcast (you’ll find a link to it at gculopes.com), but McNally said there will be a fee associated with that. Potter also will be the host for pregame videos, such as this season preview, and for postgame video interviews with Head Coach Russ Pennell and select players. 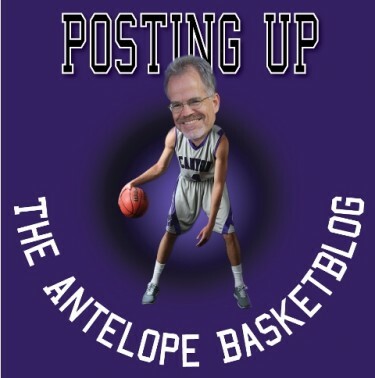 Doug Carroll's basketball blog will be a fun and informative addition to GCU's basketball coverage. The blog will be written by Doug Carroll, GCU’s director of communications, and focus on what is happening beyond the court at home and away games. Carroll’s communications team also will chime in with feature stories at news.gcu.edu. Look for one next week on Braylon Pickrel, whose last-second 3-pointer against Dixie State College last season sent GCU into the NCAA tournament. And Pennell will be on the air every Tuesday at 1:30 p.m. for his weekly radio show with Brad Cesmat at XTRA Sports (910 AM).